When you think about Thanksgiving or Christmas dinner side dishes, a stuffing is usually on the menu. 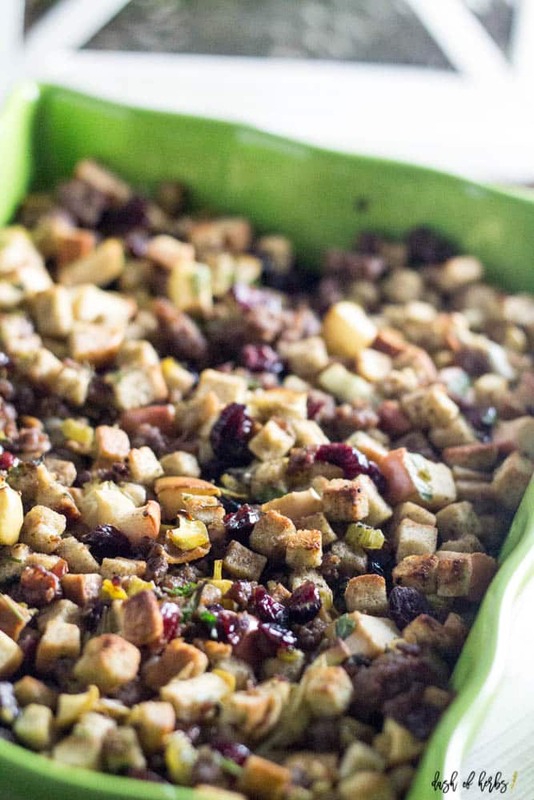 Why not dress up your typical stuffing dish with a lightener version. 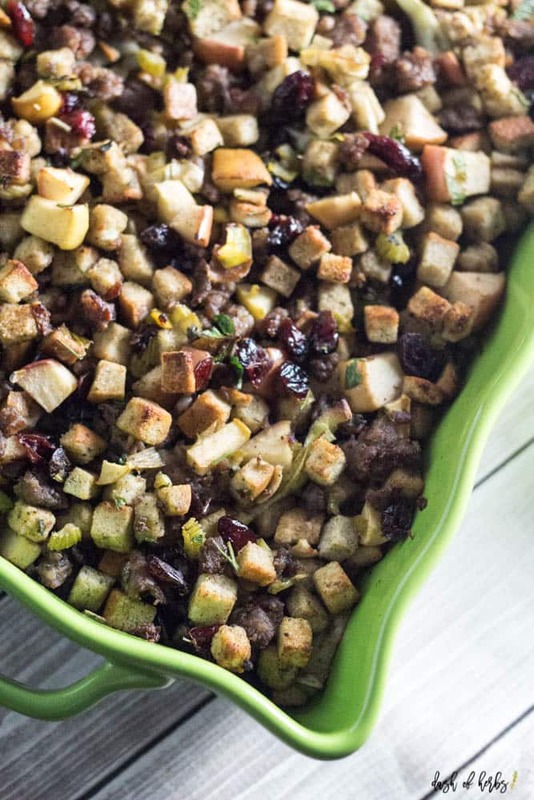 This apple sausage cranberry stuffing is amazing. 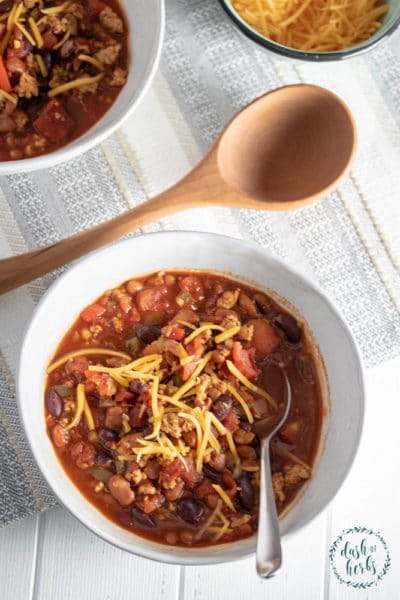 The flavors are savory, yet sweet….which makes this a classic dish you will want to have on your table every single year. This Thanksgiving we are hosting for the first time ever. I am so excited that we finally have a house big enough to have a large gathering – and family coming into town to celebrate with us. Besides the week that we moved in, we haven’t had any visitors spend the night, so I am so excited that we will have a house full over Thanksgiving. I mean, that’s what it’s all about right? Family and being thankful for our lives, successes, and love. By the way – if anyone has an easy turkey recipe, please let me know. I have gone 32 years without ever having to attempt to cook a turkey, so I am a little nervous about it. I think I know what I want to do for it, but any other ideas are welcome! Coming up with the Thanksgiving menu was also fun. 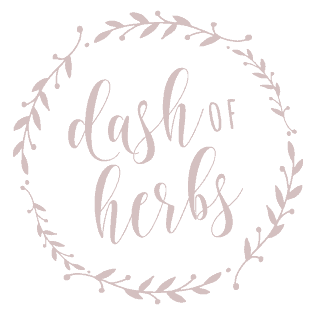 We are melding some of my family recipes with my husband’s family recipes, and I think it’s going to be a great mix of both of our upbringings. Again, this is the first time that we have hosted Thanksgiving and really the first time that we have brought both of our traditional family recipes together under one roof. I really can’t wait to see how the food comes together. 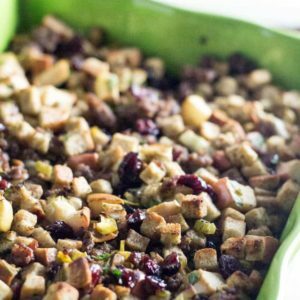 One of the dishes that has become a tradition in my family is this apple sausage cranberry stuffing. I truly love the flavors and how they all come together. You get the yummy savory flavor of stuffing with the sausage, but you also get a sweetness with the cranberries that I just absolutely love. A note: DO NOT use fresh cranberries. I tried this last year and the flavor isn’t anything like it’s supposed to be. Stick to the reduced sugar dried cranberries – you will thank me later. 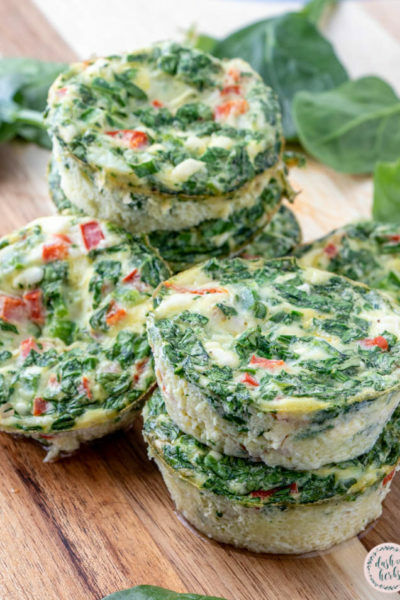 This recipe is 5 Freestyle points per serving, 1 cup. Heat a large non-stick skillet to medium heat. Add the sausage and cook until cooked through, crumbling as it cooks. Transfer the cooked sausage to a bowl and set aside. Add the butter and allow to melt. Then add the leeks, onion, celery, apples and poultry seasoning. Saute until the leeks are soft, about 8 minutes. Mix in the dried cranberries, sage and rosemary. Add the cooked sausage to the skillet and mix in the parsley and cubed stuffing. Add the chicken stock to the skillet a little bit at a time until the stuffing is moist. Try not to overdo it though. You don't want it to be mushy. Season with salt and pepper. Place in an olive oil sprayed prepared casserole dish (I use 9x13 casserole dish). Bake for 20-30 minutes until the croutons are crispy. Serve immediately. Please note that an extra large skillet is required for this recipe. I usually use a wok-style skillet and can fit everything in it. But make sure your skillet is large enough to accommodate this recipe. That’s great Jill! I love the apples in it too – and would probably add more of those too. It’s so good, isn’t it? I’m so glad you liked it! It turned out wonderful. Next time I think I’ll use even more apple because it was by far my favorite part. Thanks again for the great recipe! Thank you for the honest feedback. I have updated the recipe to include these things. I honestly think that I have made this so many times that it’s just second nature to me…but I realized when you commented that I needed to be a bit more specific with the instructions. I’m sorry about that! I added a note about the skillet size in the recipe notes of the recipe card, so hopefully that will help others who make this recipe. You definitely need a big skillet for this. 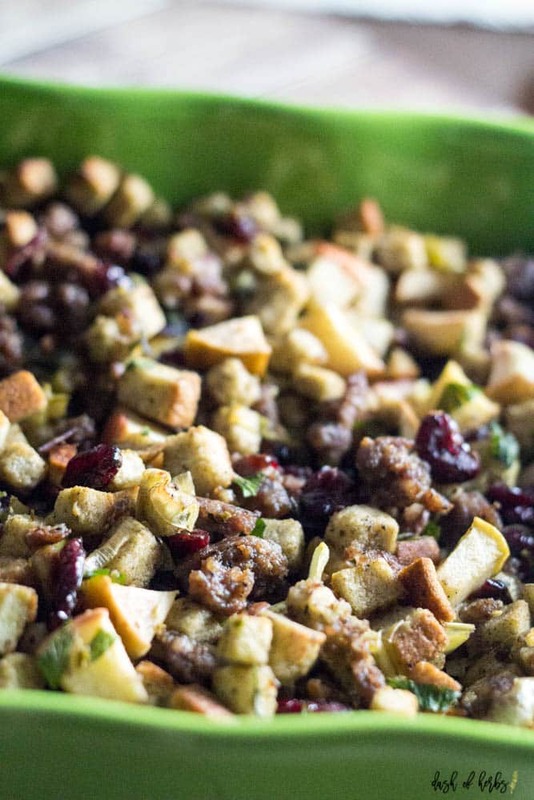 I hope you enjoyed this stuffing recipe! Finally got my casserole in the oven and can compose my thoughts. I had several issues with this recipe. What is the butter for? Also in reference to the casserole dish, prepared how? Greased or not? Also you may want to specify that the skillet used should be HUGE. I had to switch cookware halfway through. Thank you so much! Every ingredient in this dish is fabulous and totally unexpected. I LOVE leeks too. So tasty! 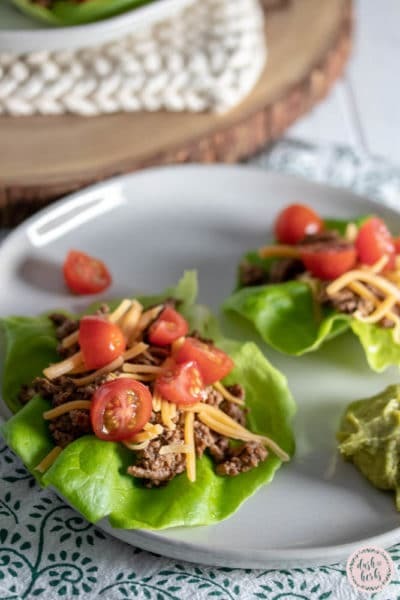 I love every single ingredient in this recipe!!! Especially the leeks!! I’m so going to try this! You don’t realize how good these flavors would be together until you bite into it. It’s sweet, yet savory and just delicious. I suggest making this for your next holiday celebration, because it’s that good. Thank you Michelle. 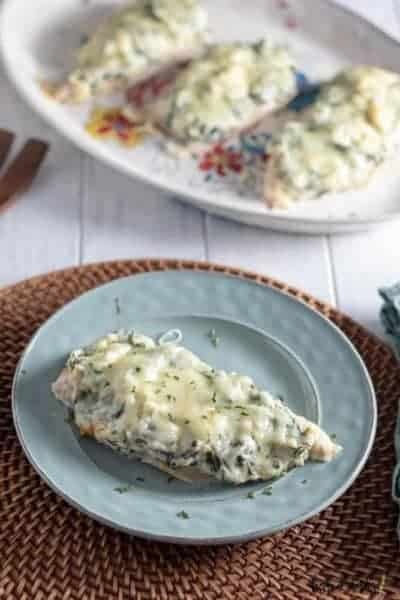 It’s so good and worth making for any holiday meal. I like this much better than the “traditional” stuffings. This would be a great side for many meals. What appealed to me most was….ummmm….everything! 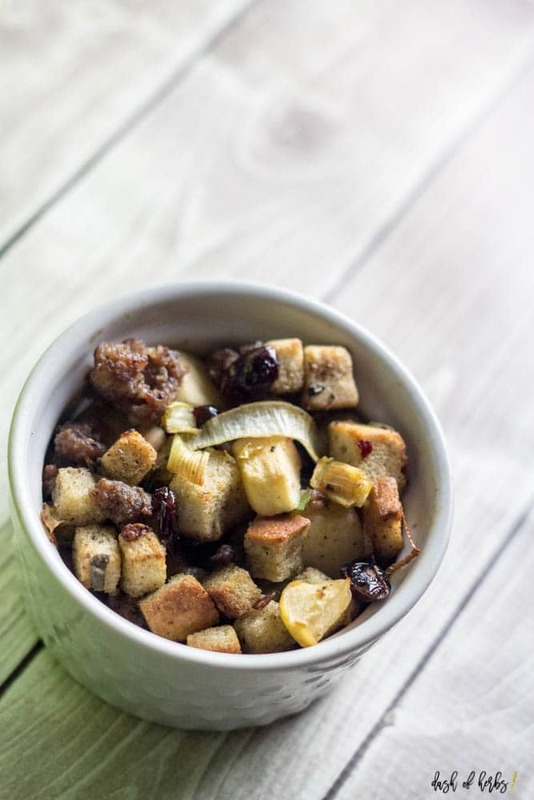 With the fruit and sausage, it is definitely not my grandmother’s stuffing. 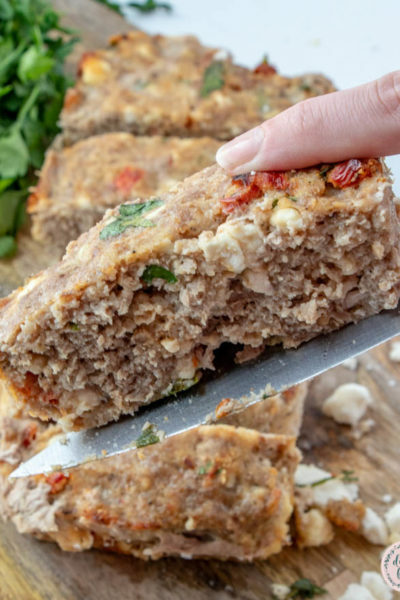 I love a good stuffing recipe and yours looks amazing!